Now, Twin Peaks is in the ether again. David Lynch is evidently shooting something Peaks-related next week, which is probably a web-bound promo for the complete box set we know to be coming later this year. So it’s a good time to revisit On the Air. Because whatever intentions Frost and Lynch may have had, that first episode is like one long dream sequence that reconfigures and laughs at the whole experience of creating Twin Peaks. Obviously this is a show about making television created by people who had just been responsible for one of the biggest events to hit television in a decade, so it seems facile to say one is necessarily related to the other. But allusions to Twin Peaks quickly pile up, and I believe that the pilot fundamentally reflects Twin Peaks, whether Frost or Lynch had such a thing in mind at the time. Just look at the plot: while creatives, crew, talent, and execs never quite sync up, the product of their collusion is a show that pushes the format of TV, then becomes a runaway success thanks to a current of genuine sweetness. And all the boundary-pushing stuff, all the things that look like self-conscious flourishes of Lynchian wierdness? Mistakes, from top to bottom. Totally unintentional. Is it coincidence that this came on the heels of a show famous for a dancing, backwards-talking dream dwarf, which some critics and audiences dinged for being weird for its own sake? Created in the middle of the second season of Twin Peaks, as that show was sliding into mediocrity, On the Air highlights two actors who played some of the more forgettable characters in the Peaks canon: Ian Buchanan, who played Lucy’s dandy suitor and possible baby daddy, is Lester Guy, the pompous and all-but washed up movie star given a second chance on TV. (Twin Peaks stars such as Richard Beymer, Piper Laurie and Russ Tamblyn were former film players who got a late-career resuscitation via the show.) David L. Lander, who appeared as the irritating Tim Pinkle on Peaks, is the director only one person understands. And Miguel Ferrer, so memorable as Albert on Twin Peaks, reprises Albert’s tone and delivery, without the same script support, for the ZBC network president. There are some other obvious nods: the ZBC network name seems like a direct parody of Twin Peaks‘ home ABC; network execs sit roped off in what could be a corner of the Black Lodge; and Twin Peaks composer Angelo Badalamenti contributes some very Peaks-esque themes, and even appears briefly as a piano player. 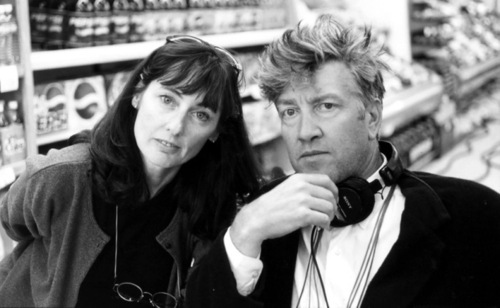 Ruth, the only one able to translate the director’s heavily accented speech, might be inspired by Mary Sweeney, who edited several Lynch projects (Fire Walk With Me, Lost Highway, Mulholland Drive) and was, broadly, his life and creative partner through the ‘90s. In fact, everyone but Ruth is skewered in On the Air: the actors are idiots, the director is an incomprehensible nincompoop, the producer is worthless, and the network higher-ups are completely ineffectual, with no understanding of the audience. Many of the jabs are light, or loving. The two sound technicians may seem redundant, but they’re such a fun pair! Lynch and Frost seem to be poking fun at themselves as much as at network brass or difficult actors; it’s all a goofy game. On the Air didn’t ever amount to much, as few of the other episodes live up to the pilot. There’s a degree to which the same concepts from the pilot are simply rehashed over and over. A few gags achieve a life of their own (the Mr. Peanuts episode is good) but things went stale very fast. Even there the show looks like a mini-vision of Twin Peaks; like art caught in a Black Lodge loop, endlessly imitating and commenting on itself.